I vividly remember the first time my mother made this recipe. A friend had given it to her (that's all I know about who to source this recipe to) and she made it one morning for breakfast. I was in love. Before this, I didn't care for oatmeal unless it was in cookie form. But this ... this was delicious. It has the perfect texture. Not mushy at all, and -- if you bake it right -- it has a thin custard-type layer on the bottom. I love custard. No fear, though. If you bake it too long, it will still be good. 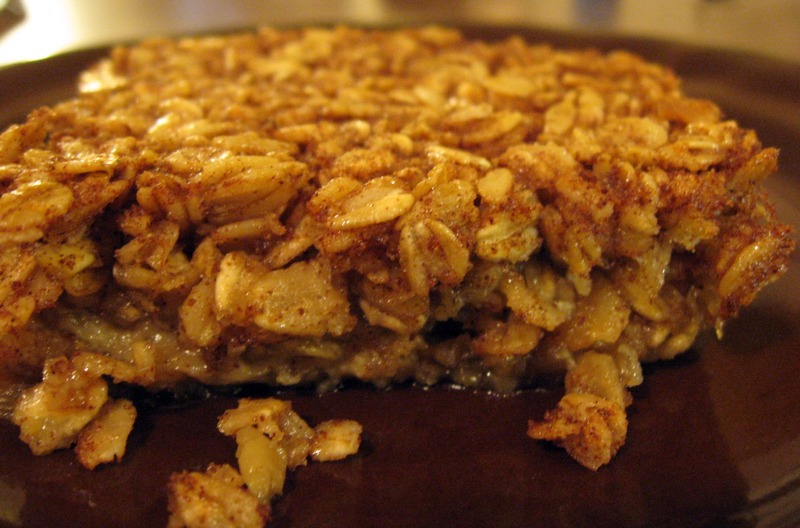 The custard layer will just be dry and the baked oatmeal itself will be more dry. By the time I was a teenager, I made baked oatmeal several times a week. I love to make it now when it's cold outside. 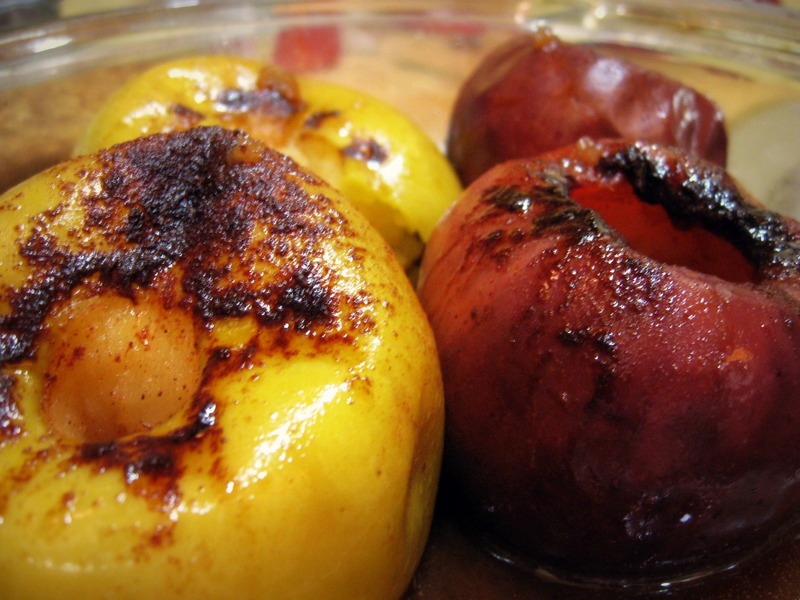 It's delicious by itself, but when I have time I like to make baked apples to serve over it, drizzling the juice on top. Some people also prefer to eat it with some milk poured over it. Not me. A word of caution for those with celiac: Even certified GF oats can cause a problem for some celiacs. If your doctor has given you the okay to try GF oats (you need to be GF at least a year before trying them) and you have problems after eating them, you may be one of those celiacs. Projected prep time: 5 min; Bake time: 30-35 min. Mix well and pour into 8-inch square baking dish. Bake at 350 degrees 30-35 minutes. 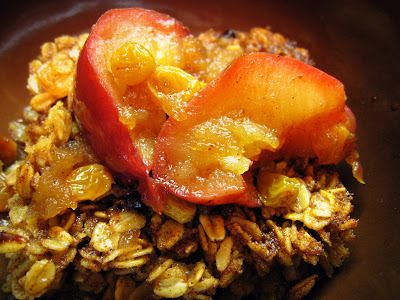 If desired, top with baked apples (and the juice) or raisins. Sometimes I'll bake chopped apples into it, but I prefer to just top it with the apples. Enjoy! I'm going to try to post, once a week, a product that helps with the gluten-free lifestyle. To kick it off, I'll start with two. Today being the first morning back to school, it was a little more difficult for the girls to get going and I ended up skipping breakfast (not the girls, just me). 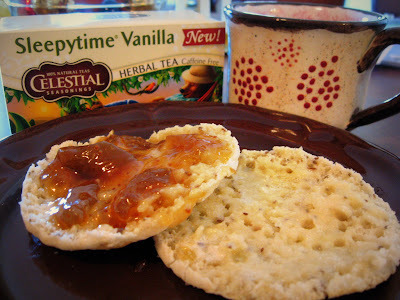 As I type, I'm enjoying a quick breakfast I love, which leads me to the first product I don't think I can live without: Food For Life gluten-free multi seed English muffins. I love mine toasted and one half slathered with butter, the other half with Bonne Maman fig preserves (which I would prefer not to live without). Give me a cup of Sleepytime Vanilla tea to enjoy with it, and I'm good to go. The second product is Triumph Dining's Gluten-Free Grocery Guide. Sure, you can go shopping without it -- but it makes it much easier, especially if you are new to the gluten-free diet. I know you can just look up a product on your phone, but I find this easier and quicker. If I'm wondering about a product not listed in the guide, I'll pull out my phone and look it up. 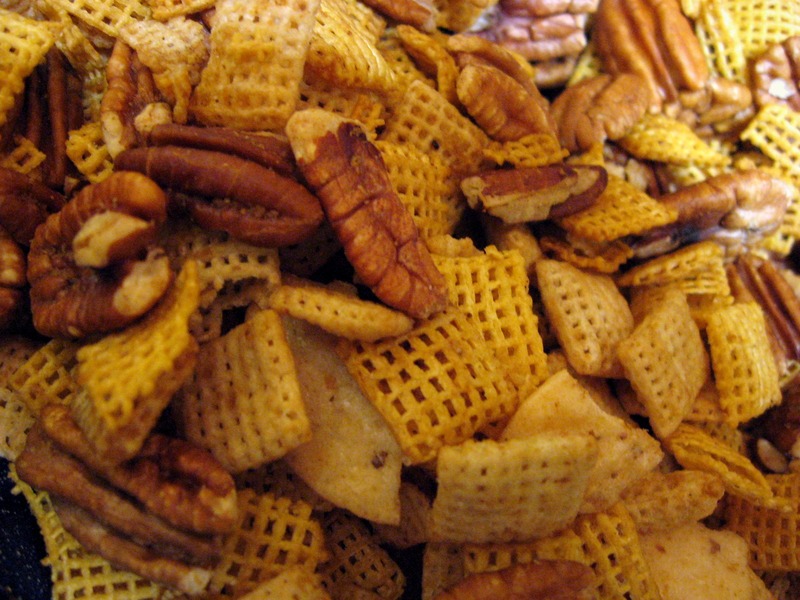 What's a party without some great homemade Chex mix? I thought this would be a good first recipe to post with the holidays upon us. One of the great things about this recipe is you can add more or less of the main ingredients to your liking, as long as it's approximately the same measurements. In the picture above -- mix I made for our family to snack on while decorating our Christmas tree the other night -- I was out of pretzels, so I used more pecans and Chex cereal, and also added Blue Diamond almond Nut Thins broken into quartered pieces. I mix and bake this in my roasting pan -- big enough to do both. 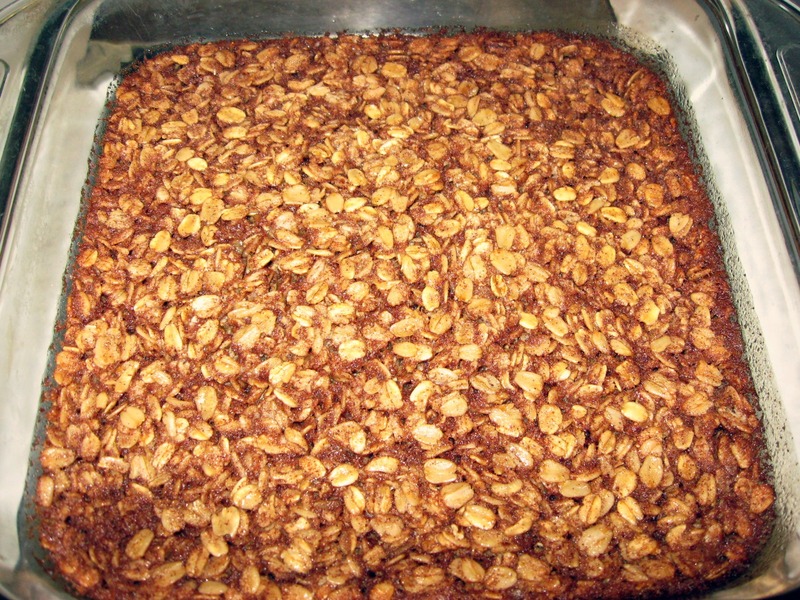 If you don't have one, use a large mixing bowl and combine cereal, pretzels and nuts. Set aside. In small mixing bowl, combine remaining ingredients, whisking well. Pour seasoning mixture over cereal mixture. Gently stir until evenly coated. Pour mixture onto 11x13 baking pan (unless you already have in the roasting pan). 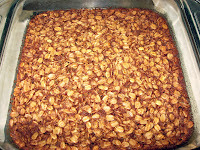 Bake at 250 degrees for 45 minutes, stirring gently and thoroughly every 15 minutes. Let cool in roasting pan or spread on paper towels. Store in airtight container. Welcome, readers, and thanks for visiting my newest blogging attempt! For family and friends who are familiar with my previous blogs, I plan to keep this one current. That's not to say, however, that I will be posting daily. I have no plans to make that kind of promise. I'm a mom with a busy life and that won't be changing in the foreseeable future -- but I do plan on posting on a semi-regular basis and I hope you'll hold me to that! I love food. I am part Cajun and both sides of my family love food. I love to cook Cajun food, Italian food, Mexican food, American food, seafood, French food and nearly any other kind of food -- as well as a combination of them. I love to cook gourmet as well as bake (yes, I made both the ice cream -- pictured in a melamine princess bowl belonging to my daughters -- and the cake pictured at the top), but let's be honest -- a busy mom doesn't always have time to immerse herself in the kitchen for hours at a time. 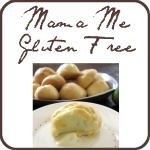 Here at Mama Me you're most likely to find recipes that are easy to make, and fairly quick, but still delicious. I will give you the occasional cook-all-day recipe, though. I hope you have as much fun trying these recipes out as I do making and eating them! I'm a journalist, wife and mother to two spirited daughters. All four of us have lived a strict gluten-free life since fall 2008 due to celiac disease and gluten sensitivity. My husband has celiac (blood tests & biopsy) and my daughters and I showed that we were reacting to gluten in tests, which was enough to know we needed to get rid of it without a biopsy to prove anything. And so you know, I'm pretty sensitive to it since I've been off of it. The small handful of times I've been accidentally glutened since removing it from my diet have made me extremely sick. My chronic stomach problems went away after getting off gluten. I have absolutely no temptation to eat anything with gluten in it, because I don't ever want to voluntarily feel that way again. I love to cook and I love to eat -- if it tastes wonderful. I try to make sure my food tastes just as good or better than it did before being GF, so I don't usually have a problem getting our children to eat it. I hope you'll agree when you try the recipes I share on my gluten-free blog. Many of my non-GF friends can't tell the difference, so feel free to try the recipes if you aren't GF! Unless otherwise noted, *I cook and bake with sea salt or kosher salt. *I use organic cane sugar instead of refined white cane sugar unless otherwise noted. *My baking powder is always aluminum-free (and gf, of course). *I also try to use organic, fresh and local whenever possible. *I do have the occasional very unhealthy, processed ingredient thrown into a recipe sometimes. I try to avoid it, but you may see it from time to time. *My measurements are always a level cup/spoon unless otherwise noted. In recipes calling for weight and/or ratio, the scale I currently use is the 5 lb from OXO . I plan on getting a larger one at some point. You can see all of my recipes and product recommendations through the recipe/subject index link provided in the sidebar of each page. Product of the week posts and any other product I mention is because I like it and want to be helpful, not because I've been given anything to say so. If I receive a freebie or any kind of payment for trying a product, I will state so. I am not a healthcare professional. 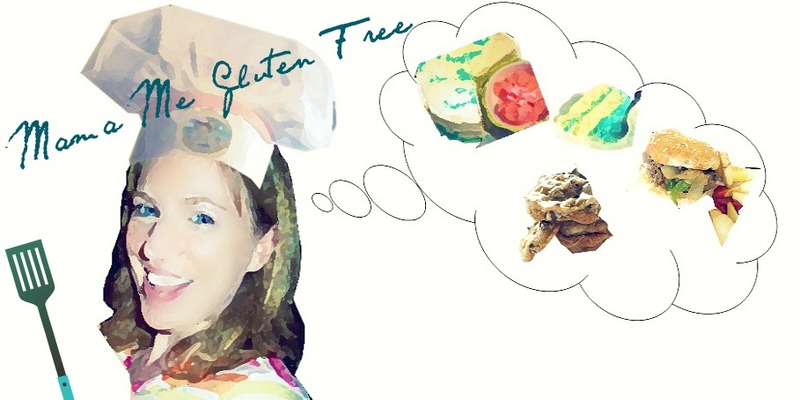 My knowledge of the gluten-free lifestyle is given to you from personal experience and research. You should always discuss your individual issues with a healthcare professional. Ads you see on this site are part of an ad network and I don't control the content. Please note that ads may show gluten-free foods, as well as foods that aren't gluten-free. All content on this blog is protected by copyright. If you want to print out a recipe for personal use, that's fine as long as the source is on your copy. If you want to link to this blog or a recipe within it, etc., that is fine as long as the source goes with it. If you aren't sure, please ask. Until I provide an e-mail address for you to contact me, the best way is through comments on the blog, through the Mama Me facebook page, or through Twitter @MamaMeGF. Want a little more information? I provided a few tidbits about myself in this Stylish Blogger Award post and in this Valentine's Day post.